Skopelos: An Alluring Greek Island in the Aegean Sea is a book of striking images and insightful text that portray the beauties, history and culture of one of the most interesting, but lesser known and least exploited of the Greek islands. 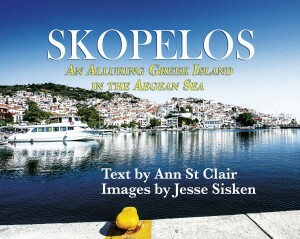 Much of this book is devoted to depicting Skopelos’s ancient monasteries, churches, and family chapels in their unique settings and wonderful variety. There are more than 350 such ecclesiastic buildings on this island of less than 6,000 people, a tribute to the place of religion in its people’s lives. This book also takes the reader into the centuries-old, narrow, winding, back streets of Skopelos’s two major towns where one can sense age-old traditions and enjoy a certain tranquility not found in more modern and traveled areas like the island’s thriving waterfront. And throughout, the reader is introduced to Skopelos’s culture and history with Its numerous architectural and archaeological treasures, footprints left behind by Minoans, Mycenaeans, Romans, Venetians and Turks, who have all been there. 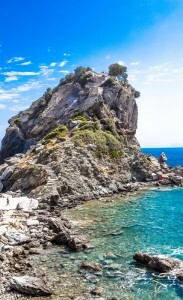 And there is much more to Skopelos, from its secluded pristine beaches and aquamarine waters to its quiet, uniquely forested hillsides. For evening fare, one can dine on traditional Greek food at waterfront tavernas while listening to water lapping against the shore and watching the sun set into the sea, leaving a crimson and golden sky behind. Skopelos is a place where visitors can step from one era into another, listen to the quintessential sound of goat bells echoing across the hillsides, or to disco music emanating from nightclubs tucked away in cobblestoned alleys. This is an island not to be missed, and this book shows why. Chapel of St. John of the Rock Made famous by the movie, “Mama Mia”.